With the roof sign up there is no mistaking this place for anything but a "Hot Dog Joint"
The sign went up this morning and it sure is an eye catcher. With our new, forest green roof for a background, the hot dog and bun stand out like a beacon calling to all passing hot dog lovers. The planting areas (you can see one of them in the foreground) on each side of the parking lot entrance were filled with loam later today and they will soon be filled with plenty of colorful flowers. We are getting there, but there is still a lot to do. The big day for Yank's Franks has been delayed. A new roof and a new floor (that's it in the photo. Spiffy, huh?) have caused us to push out our targeted opening date by a week. We now anticipate opening on August 10th. Our apologies to all those that made flight arrangements, but we'll try our best to make it up to you. One more week of anticipation. 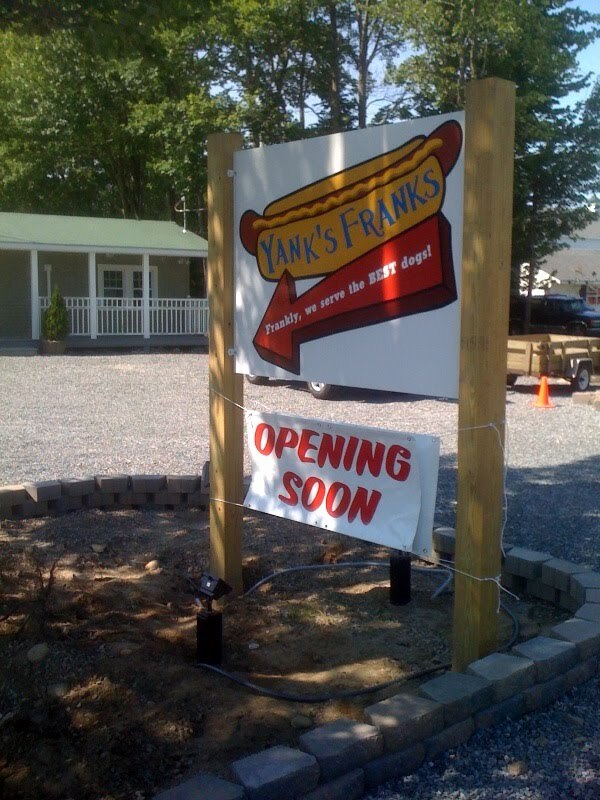 One more week to decide if your first hot dog at Yank's Franks will be the Chili Dog. I mention the Chili Dog because that is what I'm thinking will be my first hot dog at Yank's Franks. I was describing our Certified Angus Steak (not ground beef) Chili to one of the workers at Yank's Franks today. I can't get it out of my mind. Our chili is awesome and I'll top it with shredded cheddar cheese and diced onions. All that on top of a perfectly griddled dog that is nestled (fancy word) in a buttered and toasted New England hot dog bun. I'm getting two Yank's Franks Chili Dogs, an order of the crispiest fries in New England and I'm going to wash them down with a Smoothie. 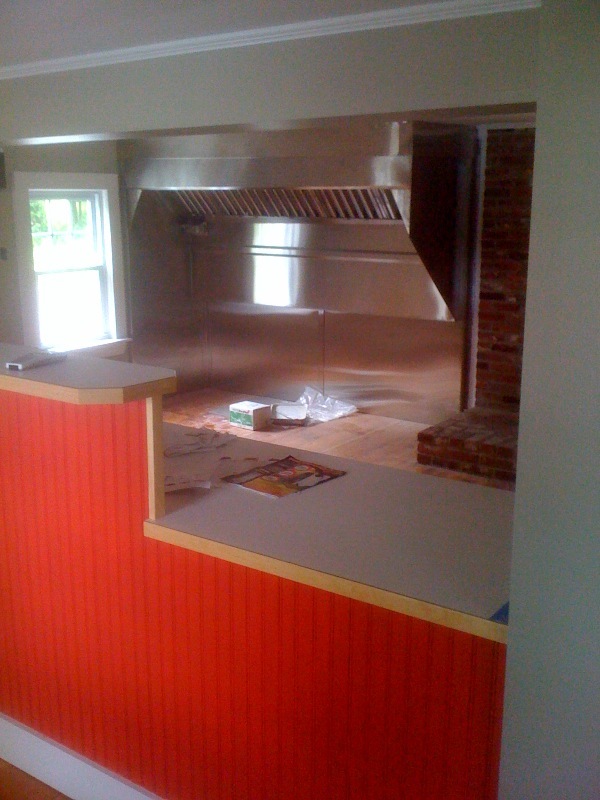 The inside of Yank's Franks is looking pretty spiffy. The walls are up, the counter is in (and painted Tomato Red). Tomorrow the kitchen area will have a new black and white floor installed. The beautiful wood floor will be covered in order to make clean up easier and to keep the area sanitary. 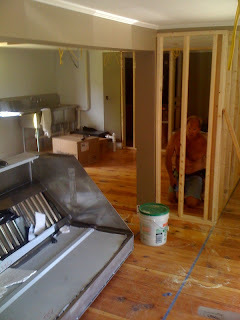 The customer area, as well as the back storage room, will still have those shiny wood floors. 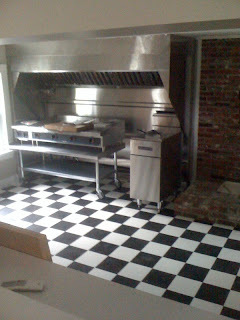 The cooking and refrigeration equipment will begin to show up on Tuesday. I can almost smell the hot dogs cooking now. My Roof Has A Hole In It And I Might Drown! Our roof sign is done and ready to go. 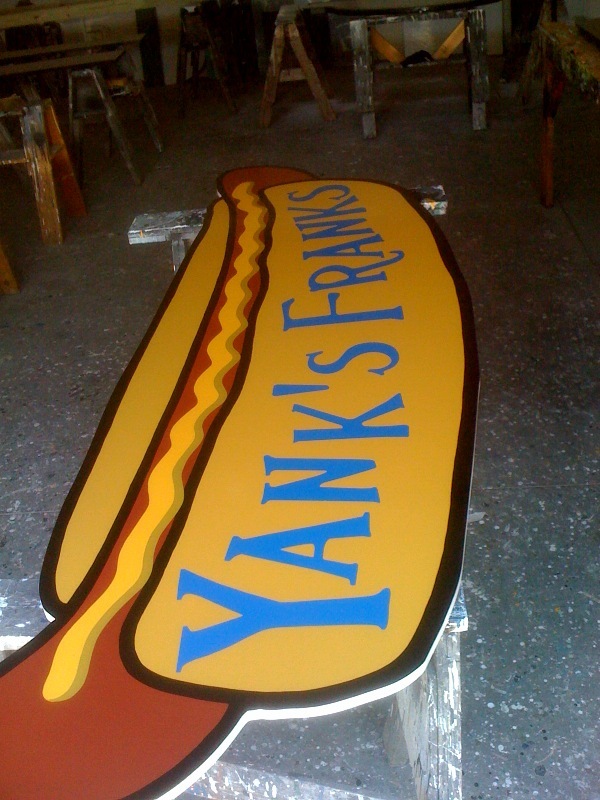 The 8 foot hot dog looks awesome and I can't wait to see it sitting atop Yank's Franks. Unfortunately, after the installation of the exhaust hood, we sprung a leak. The installers gave us the bad news that the roof has 5 layers of shingles on it. Obviously, totally contrary to the building code. (why didn't the building inspector catch this??? Argh!) We had a choice, patch it and take our chances, or get a new roof. It's an unfortunate situation, but an easy choice. A new roof it is. I'll have more photos of the inside on Thursday. It looks really good. It was never more true than it is in this photo...as they say, a picture is worth a thousand words! We even have a target opening date...Tuesday, August 3, 2010. Ballparks have added pizza, Cuban sandwiches, steak tips, lobster rolls and that's just the beginning. With all these gastronomical delights, the good old hot dog remains in the top spot among fans. 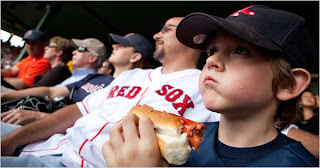 Of course, the ballpark that outsells all others when it comes to hot dogs...Fenway Park. We all know that, but at which ballpark do hot dogs get upstaged by sausages? That would be Miller Park in Milwaukee where Brewers fans are treated to a race each game between mascots dressed as a Bratwurst, a Polish Sausage, An Italian Sausage a Chirizo and a Hot Dog. The six month long, constant search has come to an end. After trying, what seemed like thousands of different kinds of chili, and after the Hot Dog King cooked dozens of different chili recipes (most of which he made up himself) we can finally breathe a sigh of relief. To say we were nervous is an understatement. 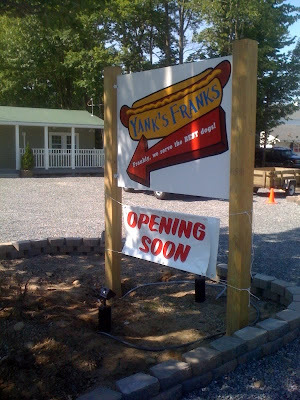 Here we were just weeks away from opening Yank's Franks and no chili to go on the chili dogs ~~ unthinkable! So, tonight we sleep knowing all of you chili dog fans will leave Yank's Franks with big smiles on your faces (and plans to return for more). 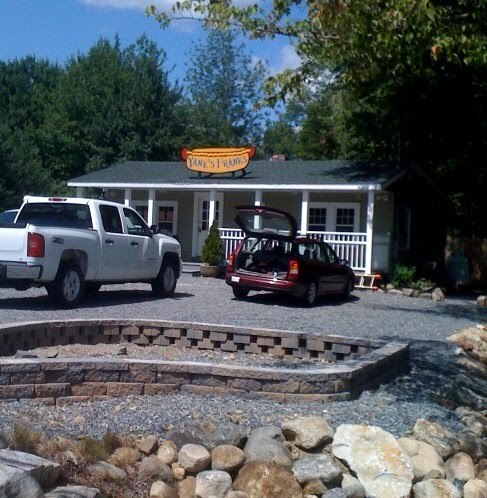 The chili that will be served at Yank's Franks is not made with ground beef. Our chili is not made with steak. Yank's Franks chili is made with Certified Angus Beef steak. Angus Beef is a select breed of Scottish cattle. Considered a premier beef, the Angus has become widely known with its name being synonymous with quality. Certified Angus Beef has become known as the best of the best. Its certification is received only after meeting a rigorous set of standards. Yank's Franks Chili Dogs will soon be known as the best of the best. 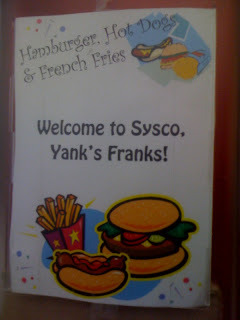 At Yank's Franks, We Eat So You Don't Have To!~~~That Doesn't Sound Right?? Can you guess what Hot Diggity and I were doing today? Our goal was to complete the offerings for our menu. After a day of eating, and eating and more eating we left full, and in need of a long nap. But, it was a very satisfying day in more ways than one. We tried some great hot dogs with interesting toppings. We even had a footlong hot dog that was easily 18 inches long (please, no jokes). We had an awesome hamburger. There were at least 5 different types of french fries and another 5 types of onion rings. We sampled two types of chili. I thought the first chili was very good. Chef Gary suggested we hold our praise until after the next serving. He was right, the second chili was one of the best I had ever enjoyed. All this sampling was topped off with a whoopie pie. I love whoopie pies, but how did they know? After all this, and as an after thought, the Chef went to his freezer and came out with two Cool Dogs. 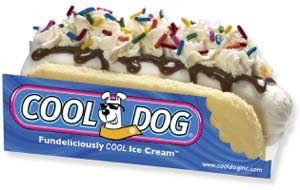 Cool Dogs are delicious, premium vanilla ice cream (some of you probably know how much I love vanilla) wrapped in a mouth-watering cake and topped with rich chocolate that melts in your mouth. What else could one ask for? And, some of them may be Cool. Well, maybe that isn't the best way to describe what's happening at Yank's Franks. We're still a few weeks from actually cooking, but things are really changing at 1738 Post Road. As you can see, the walls are framed. 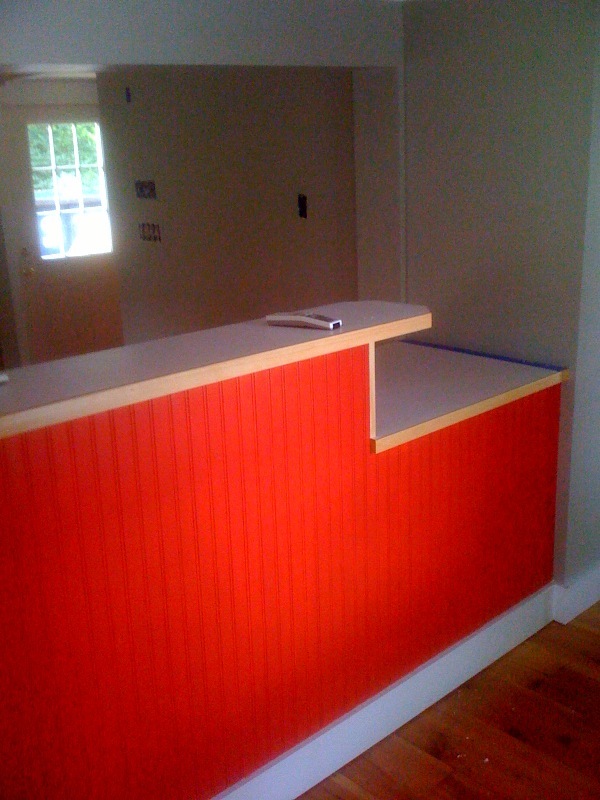 The counter is being built off-site. In the lower left of this photo of the interior of the building, you can see the cooking hood, which was scheduled for installation today. Unfortunately, there was a small error in the exhaust ducts so it will be re-tooled and ready to go for Thursday installation. Also, on the left of this interior photo you can see some light shining in. That's our new rear door. Well, it's not a rear door yet, it's a hole where the rear door will soon be installed. While all this progress was happening inside, the landscapers were working their magic outside. 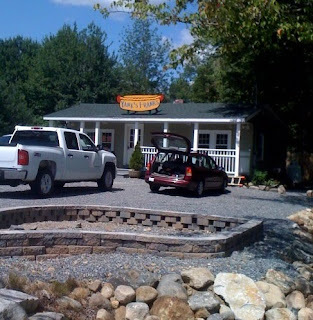 This photo of the exterior shows the landscapers working on the area where Yank's Franks outside dining [strike that] where Yank's Franks al fresco dining will be enjoyed on a beautifully, professionlly manicured lawn. Beyond the lawn, the workers later began improving the parking area to make it more enticing to the hungry passersby (that's not even a word, is it?). I'm looking forward to keeping you updated as more work progresses. 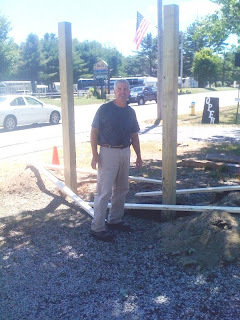 Thanks to the help of Coney Island Jack, the street sign posts for Yank's Franks went in today (that's him showing off his work). They are level in all three directions, they are the proper distance apart and they are cemented in. And look at Route 1. That's trafffic out there. Look into the windows of those automobiles and you can see people that are clearly jonesing for hot dogs. Sorry folks, you'll have to wait a little longer. It's Here! In 1957, The U.S. Chamber of Commerce designated the month of July, National Hot Dog Month. This month alone, Americans will consume 150 million hot dogs. And, what will they put on those hot dogs? The number one condiment is easy, it's mustard. Number two gets a little more difficult since there are strict rules governing its use on hot dogs. That should be enough of a hint for the readers of my blog who will recognize this "hot dog controlled substance" as ketchup. And the number three most popular condiment is still more difficult. I celebrated the start of National Hot Dog Month with this condiment when I enjoyed my Chili Dog for lunch today. Yes, chili is even more popular than relish. If you are wondering what 150 million hot dogs might look like...that's enough to stretch across the United States, from coast to coast, more than five times. It is no wonder that, with such popularity, the hot dog is recognized for the entire month of July. The National Hot Dog and Sausage Council has today unveiled a series of four commemorative placemats that are sure to liven up any hot dog gathering. Ironically enough, one of the four includes, "Hot Dog Etiquette" so those over the age of 18 years and using Ketchup on their hot dog, can see exactly which rule they are breaking. Yank's Franks wishes everyone a wonderful Hot Dog Month!